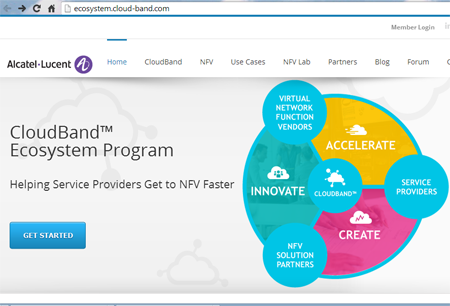 Alcatel-Lucent announced the formation of the CloudBand Ecosystem Program, an open community of service providers, developers and vendors adopting Network Functions Virtualisation (NFV) technology. Alcatel-Lucent said NFV technology promises to bring the agility, efficiency and economics of the cloud to service provider networks and business operations, allowing operators to offer cloud services with the performance and reliability that consumers and enterprises expect. Virtualizing network functions allows faster and more efficient deployment where they are needed. In addition, service life-cycles can be more easily managed to meet dynamic customer demands without the huge investments in time, costs and power that are currently required. 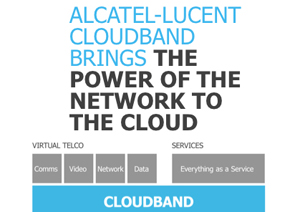 Following a limited rollout with a small group of vendors, Alcatel-Lucent has now opened up the CloudBand EcoSystem Program to a wider circle of businesses, with 15 companies – including Deutsche Telekom, Telefonica, Citrix, Intel, Vyatta, Radware, Red Hat, HP, Nuage Networks, Gigaspaces, StackIQ, Inktank and Nominum signed up. Axel Clauberg, VP IP and Fixed Access Architecture, Group CTO team, Deutsche Telekom AG, said: "As an industry we need to accelerate the journey towards NFV. There are 2 main parts in making this happen that need to work well with each other through experimentation and iterations: 1. Wide array of best of breed 'virtual network functions' that currently run on purpose built HW and 2. An NFV cloud Platform that's optimized to run these functions at scale. We're happy to see Alcatel-Lucent CloudBand open up their NFV platform for any company developing virtual network functions to help accelerate this journey." Roy Amir, Vice President, Strategy & Ecosystem, CloudBand, Alcatel-Lucent, said: "Alcatel-Lucent is dedicated to helping service providers advance quickly in the area of NFV. The CloudBand Ecosystem Program aims to do just that, providing a workspace where companies can access CloudBand and collaborate and learn from each other. This will help service providers adopt a completely new NFV operational model using services and solutions that have been developed with them and their customers' needs in mind." Alcatel-Lucent inaugurated a cloud research and development center in Kfar Saba, Israel and outlined its plans to accelerate the rollout of Network Functions Virtualisation (NFV) and Software-Defined Networking technologies. Alcatel-Lucent’s cloud facility in Israel operates in close collaboration with the company’s Bell Labs innovation arm and is an incubation center for NFV activities and customer projects. At the center of this work is Alcatel-Lucent’s CloudBand™ solution -- the industry’s first open, multivendor NFV management platform enabling service providers to bring the benefits of the cloud to their own networks and business operations while offering cloud services with the security, reliability and quality enterprises and consumers expect from telecommunications networks. The facility at Kfar Saba also has a collaborative relationship with major Israeli universities, specifically Tel-Aviv University and Technion, to research distributed cloud optimization. Alcatel-Lucent’s CloudBand solution is an open NFV platform for the distribution, automation and life-cycle management of cloud services. The CloudBand Management System orchestrates and optimizes services between the communications network and the cloud, while the CloudBand Node provides the computing, storage and networking hardware and associated software to host a wide range of cloud services. IBM agreed to acquire The Now Factory, a privately held provider of analytics software for communications service providers, for an undisclosed sum. The Now Factory, which is based in Dublin, Ireland, provides real-time insights by analyzing massive quantities of network and business data. The analysis helps network operators understand how their customers are experiencing mobile services. In addition to its ability to detect and resolve issues, The Now Factory's software helps CSPs better understand how a subscriber interacts with cloud-based services, such as mobile applications. For example, a CSP can use The Now Factory's software to analyze customer usage of 3G and 4G LTE data services and identify high volume pre-paid subscribers. This can result in a targeted campaign to convert high volume pre-paid subscribers into post-paid accounts. IBM said the said the acquisition complements its MobileFirst Analytics portfolio, which is designed to enhance the way organizations analyze mobile device usage to provide exceptional customer experiences. For example, IBM InfoSphere Streams augments The Now Factory data mediation and analytics, and extends the range of use cases to include more real-time analytics on data in motion. The Now Factory's clients can also now access IBM PureData System for Analytics and Hadoop-based IBM InfoSphere BigInsights for exploration and deep analysis of subscriber and network data. "The Now Factory's innovative solutions are all about enabling quick insights for better business results in the highly competitive telecommunications landscape," said Tom Morrisroe, CEO, The Now Factory. "As part of IBM, we can now extend our technologies to a broader range of clients to help them uncover new, untapped growth opportunities, and achieve tangible business value from big data and analytics." "Today's announcement is part of IBM's strategy to continually establish leadership in the era of big data and capitalize on the opportunity to analyze data in real time," said Bob Picciano, General Manager, Information Management, IBM Software Group. 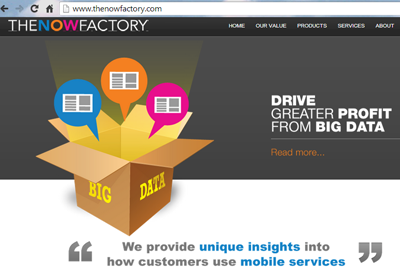 "The Now Factory's software enhances IBM's Big Data and Analytics portfolio by improving the speed, development and implementation of big data solutions, and gives communications service providers the ability to better service their customers." 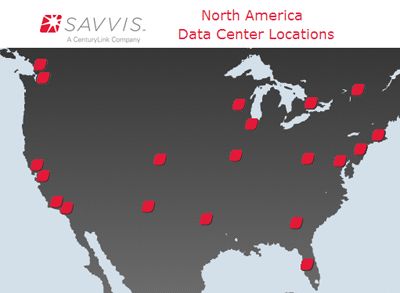 Savvis announced plans to open a new data center in the Minneapolis-St. Paul area in spring 2014. MN2 will serve as the Minneapolis area's first multitenant Tier III data center to receive certification from both the Uptime Institute and the U.S. Green Building Institute's Leadership in Energy & Environmental Design. It will be built to support 4.8 megawatts of IT load on 100,000 square feet of raised floor space. Savvis plans to with an initial 1.2 megawatts and 13,000 square feet of raised floor space. "We are investing in technology infrastructure that allows our diverse business community to continue to grow and innovate," said Duane Ring, CenturyLink Midwest region president. "We're pleased to announce the first phase of development for this new data center and look forward to the opportunities this creates for businesses in the Twin Cities and around the world." Compass Datacenters will develop the data center on 10 acres of property it owns in Shakopee, Minn., a Minneapolis suburb, and lease the facility to Savvis. 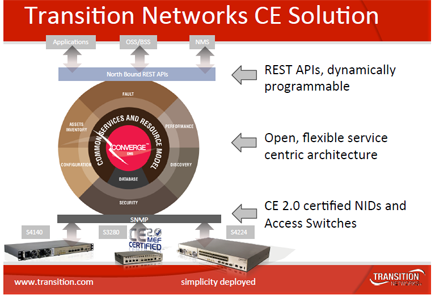 Transition Networks launched its integrated Carrier Ethernet 2.0 + software defined services (SDS) orchestration solution designed to automate the entire service lifecycle, accelerate the rollout of MEF CE 2.0 services while supporting stringent performance SLAs. The rollout includes CE 2.0 demarcation devices, access switches and a "Converge EMS" service and resource manager that automates the complete service lifecycle. The Converge EMS features a RESTful API that allows for integration with SDN and other 3rd party applications for truly programmable networks. It open architecture, based on the Amartus Chameleon SDS platform, supports next-generation service delivery workflows. Transition Networks said its solution offers a unique template-based automated provisioning solution that enables rapid service activation with quicker time to revenue. Transistion's demarcation devices feature advanced Service OAM (IEEE 802.1ag and ITU Y.1731) Performance and Fault Management for strong performance assurance in business, mobile backhaul and cloud services while reducing operational expenses. The S4140 demarcation device enables service providers to address growing bandwidth needs for next-generation services. The company’s two new Carrier Ethernet switches, S4212 and S4224, aggregate traffic from demarcation devices for efficient transport to the core network. For mobile backhaul, Transition also features a unique capability to convert between Synchronous Ethernet and IEEE 1588v2 synchronization methods while maintaining clock accuracy. Additional features include service activation capabilities to assist with circuit turn-up and maintenance and linear and ring protection capabilities for sub-50 millisecond failover providing service redundancy. 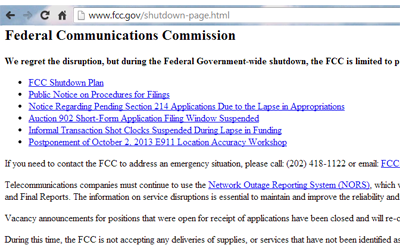 As part of the government shutdown, the FCC closed its offices and deactivated its website. During the shutdown, the FCC expects to have 38 essential employees on-duty and safeguarding operations -- about 2% of its staff. The FCC said its main filing window, mail room, and all electronic filing systems, with the exception of the Network Outage Reporting System (NORS), will remain closed until further notice. Private delivery mailings will be returned. 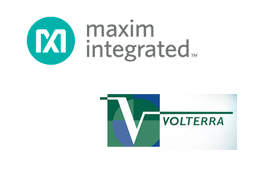 Maxim Integrated Products completed its previously announced acquisition of Volterra Semiconductor Corp. (NASDAQ:VLTR) for $23 per share. Volterra supplies high-current, high-performance, and high-density power management solutions. The company develops highly integrated solutions primarily for the enterprise, cloud computing, communications, and networking markets. Volterra's portfolio of highly integrated products enables better performance, smaller form factors, enhanced scalability, improved system management, and lower total cost of ownership.